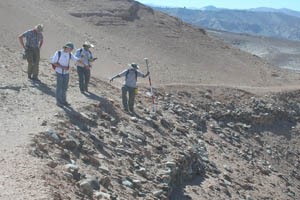 Objective of visit: To participate in the Misti Archaeological Project in the Vitor Valley, near Arequipa in southern Peru, especially to continue the topographical survey of the different Millo sites and instruct students in the use of various survey instruments (total station, differential GPS) and software (ForeSight, AutoCAD, ArcGIS). Analysis of the recovered ceramics and the organic residues preserved therein is on-going. Fellow visitors: Students, staff and faculty of the Misti Archaeological Project, directed in the field by Augusto Cardona, Centro de Investigaciones Arqueologicas de Arequipa, and Maria Cecilia Lozada, University of Chicago. 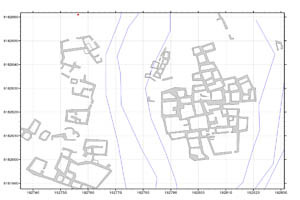 All structures at Millo II, III and IV, the major sites within the Millo complex, were located on a measured plan, while the location of other ancient sites were determined. Selected areas of Millo II were excavated revealing the remains of household and communal activities below a thick layer of tephra (volcanic ash) laid down around 1600 CE. Approximate position and date of the site: The different Millo sites are located near the northern end of Valle de Vitor, about 40 km. southwest of Arequipa, the second largest city in Peru. The Millo complex comprises a number of sites mostly dating from 500 BCE-1550 CE (contemporary with the Tiwanaku, Wari and Inka cultures). Short description of the site: The Vitor Valley is a fertile Andean Valley in the shadow of the Chachani and Misti volcanoes. Since the colonial invasion of Peru most of the agriculture concentrates on grapes, for wine and pisco production, now supplemented with horticulture (artichokes, peppers, onions) and subsistance farming. The main focus of our research in the Vitor Valley is currently Millo II, the largest ancient site in the area. This site apparently reflects a combination of local and Wari influences, now interpreted as the Wari Empire at least temporarily dominating the local cultural and administrative structures, but not completely replacing them. Millo II comprises residential areas, but also an section currently interpreted as administrative or ceremonial and a mountaintop enclosed by a wall but otherwise mostly void of structures. Other sites within the Millo complex are further from the river and the fields in the valley. They are either contemporaneous with Millo II or predate that site. Their function and relation to Millo II and Valle de Vitor is as yet unclear. My work in Peru would not have been possible without the Vitor Archaeological Project, the Cotsen Institute of Archaeology and the Institute for Field Research.